As you may have noticed, temperatures have risen and the days have grown longer – yet seem to pass that much quicker. 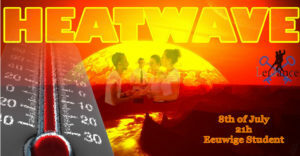 But we have had reports that something is coming, something big… A heatwave! On July 14th, temperatures will rise to absurd levels in Leiden. So take out your beach outfit, summer dress or scuba gear and join us for the last big Leidance party of the year! With salsa, kizomba, bachata, chachacha and even some reggaeton music, it will surely be a night to remember! The party will be at the Eeuwige Student, close to Leiden Central Station.